ILRI’s new regional representative for East and Southeast Asia Steve Staal (picture credit: ILRI). 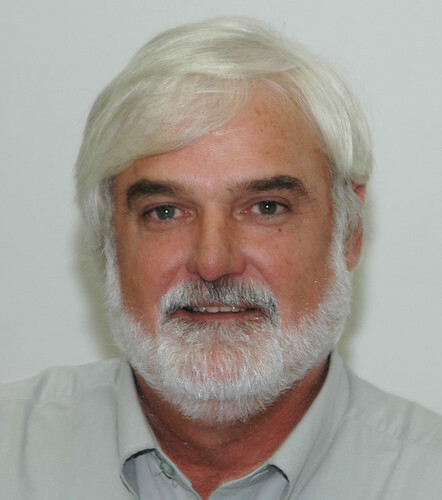 Steve Staal has been appointed the new regional representative of the International Livestock Research Institute (ILRI) for East and Southeast Asia. An American citizen who has lived and worked in developing countries throughout his life, Staal will be based at the headquarters of the International Rice Research Institute (IRRI), in Los Baños, The Philippines. Staal, an agricultural economist by training, has been based at ILRI’s headquarters in Nairobi, Kenya, for many years, where he recently led ILRI’s Markets, Gender and Livelihoods Research Theme and in the past year served as ILRI’s interim deputy director general for research, during the institute’s transition to a new management team. Among other assignments, he has worked in South and Southeast Asia to enhance smallholder dairy and pig systems in particular. He has a long-standing track record in making a difference in policy analysis and advocacy for inclusive and pro-poor smallholder livestock-based development. 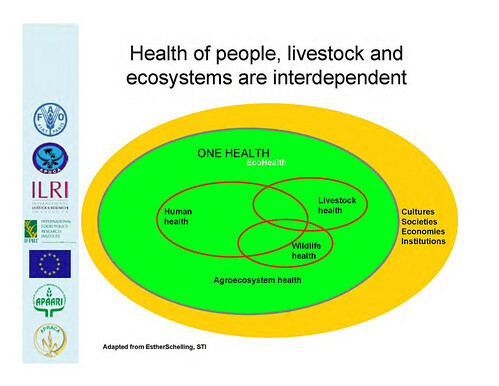 This ILRI position for coordinating and shaping ILRI’s collaborative livestock research in East and Southeast Asia is new. 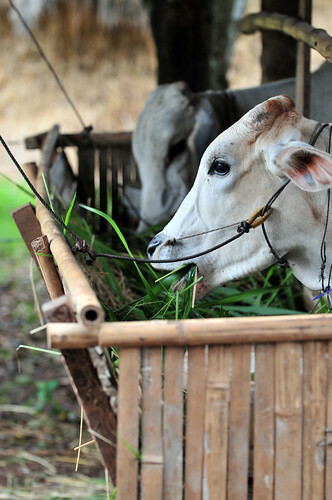 Staal’s appointment to it is a reflection of ILRI’s intent to strengthen its presence in Asia and its productive partnerships there so as to provide better support for livestock research for development in the region. 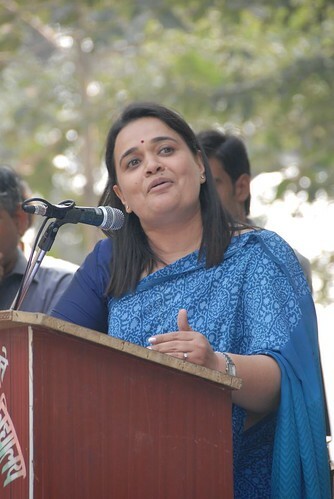 Purvi Mehta-Bhatt (India), who has been heading ILRI’s research in all of Asia, will continue to represent ILRI in South Asia. ILRI’s head of Asia Purvi Mehta-Bhatt, taken during a field day In Haryana, India, in 4 Nov 2012 (picture credit: ILRI). This new assignment for Staal and new focus for Mehta-Bhatt is made to increase ILRI’s engagement with partners throughout Asia. ILRI stakeholders are encouraged to communicate with Steve Staal, at s.staal [at] cgiar.org, on areas of potential mutual interest, including opportunities for new collaborations and interactions, in East and Southeast Asia. 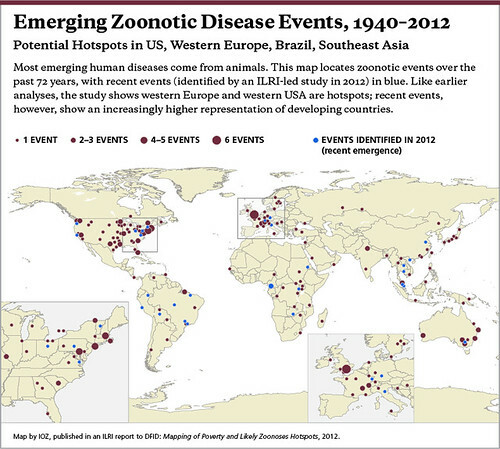 A new study maps hotspots of human-animal infectious diseases and emerging disease outbreaks. The maps reveal animal-borne disease as a heavy burden for one billion of world’s poor and new evidence on zoonotic emerging disease hotspots in the United States and western Europe. The new global study mapping human-animal diseases like tuberculosis (TB) and Rift Valley fever finds that an ‘unlucky’ 13 zoonoses are responsible for 2.4 billion cases of human illness and 2.2 million deaths per year. The vast majority occur in low- and middle-income countries. The study, which was conducted by the International Livestock Research Institute (ILRI), the Institute of Zoology (UK) and the Hanoi School of Public Health in Vietnam, maps poverty, livestock-keeping and the diseases humans get from animals, and presents a ‘top 20’ list of geographical hotspots. ‘Exploding global demand for livestock products is likely to fuel the spread of a wide range of human-animal infectious diseases,’ Grace added. According to the study, Ethiopia, Nigeria, and Tanzania in Africa, as well as India in Asia, have the highest zoonotic disease burdens, with widespread illness and death. Meanwhile, the northeastern United States, Western Europe (especially the United Kingdom), Brazil and parts of Southeast Asia may be hotspots of ’emerging zoonoses’—those that are newly infecting humans, are newly virulent, or have newly become drug resistant. Remarkably, some 60 per cent of all human diseases and 75 per cent of all emerging infectious diseases are zoonotic. Among the high-priority zoonoses studied here are ‘endemic zoonoses’, such as brucellosis, which cause the vast majority of illness and death in poor countries; ‘epidemic zoonoses’, which typically occur as outbreaks, such as anthrax and Rift Valley fever; and the relatively rare ’emerging zoonoses’, such as bird flu, a few of which, like HIV/AIDS, spread to cause global cataclysms. While zoonoses can be transmitted to people by either wild or domesticated animals, most human infections are acquired from the world’s 24 billion livestock, including pigs, poultry, cattle, goats, sheep and camels. Today, 2.5 billion people live on less than USD2 per day. Nearly three-quarters of the rural poor and some one-third of the urban poor depend on livestock for their food, income, traction, manure or other services. Livestock provide poor households with up to half their income and between 6 and 35 per cent of their protein consumption. The loss of a single milking animal can be devastating to such households. Worse, of course, is the loss of a family member to zoonotic disease. Thus, while the developing world’s booming livestock markets represent a pathway out of poverty for many, the presence of zoonotic diseases can perpetuate rather than reduce poverty and hunger in livestock-keeping communities. The study found a 99 per cent correlation between country levels of protein-energy malnutrition and the burden of zoonoses. In the booming livestock sector of developing countries, by far the fastest growing sectors are poultry and pigs. 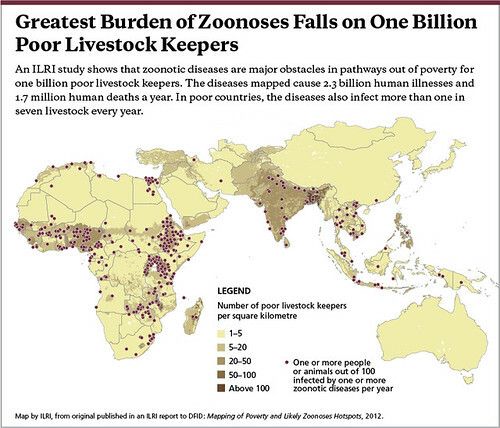 Map by Institute of Zoology (IOZ), published in an ILRI report to DFID: Mapping of Poverty and Likely Zoonoses Hotspots, 2012. Assessing the likely impacts of livestock intensification on the high-priority zoonoses, the study found that livestock density is associated more with disease ‘event emergence’ than with overall disease burdens. Both the northeastern United States and Western Europe have high densities of livestock and high levels of disease emergence (e.g., BSE, or ‘mad cow’ disease, and Lyme disease), but low numbers of people falling sick and dying from zoonotic diseases. The latter is almost certainly due to the relatively good disease reporting and health care available in these rich countries. ‘These findings allow us to focus on the hotspots of zoonoses and poverty, within which we should be able to make a difference’, said Grace. 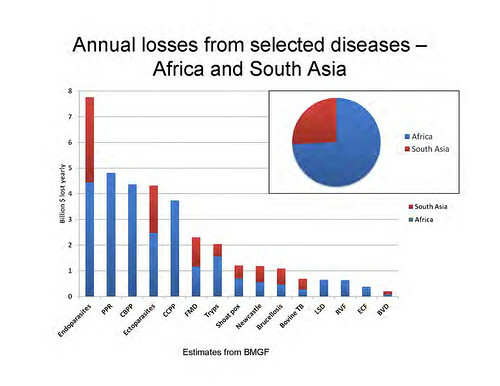 [i] Nature, Vol 451, 990–993, 21 February 2008, Global trends in emerging infectious diseases, Kate E Jones, Nikkita G Patel, Marc Levy, Adam Storeygard, Deborah Balk, John L Gittleman and Peter Daszak. Poultry seller at the morning market in Chokwe, Gurue, Mozambique (photo credit: ILRI/Stevie Mann). From dairy cooperatives, text messaging and grain storage to improved credit, transport and trade initiatives, a new book presents ‘high-payoff, low-cost’ solutions to Africa’s underdeveloped agricultural markets and chronic food insecurity. As a food crisis unfolds in West Africa’s Sahel region, some of the world’s leading experts in agriculture markets say the time is ripe to confront the ‘substantial inefficiencies’ in trade policy, transportation, information services, credit, crop storage and other market challenges that leave Africans particularly vulnerable to food-related problems. ‘We can’t control the weather or international commodities speculators, but there are many things we can do to improve market conditions in Africa that will increase food availability and help stabilize food prices across the continent,’ said Anne Mbaabu, director of the Market Access Program at the Alliance for a Green Revolution in Africa (AGRA), which has invested US$30 million over the last four years to improve market opportunities for Africa’s smallholder farmers. Its publication comes as international aid groups are rushing assistance to Niger and other nations of the African Sahel—a narrow but long belt of arid land south of the Sahara that stretches across the continent—where a combination of high food prices and poor weather has left some 14 million people without enough to eat. The food problems in the Sahel are emerging just as African governments and aid groups say they have stabilized a food crisis in the Horn of Africa that at its peak in Somalia had left 58 percent of children under the age of five acutely malnourished. But while volatility in international commodities markets is being widely cited as a major cause of the food shortages in the Sahel, there is growing evidence that at least some of the food price fluctuation in Africa is caused by domestic factors. Recent research—led by Joseph Karugia, Coordinator of the Regional Strategic Analysis and Knowledge Support System for Eastern and Central Africa (ReSAKSS-ECA) at ILRI, and colleagues at the Association for Strengthening Agricultural Research in Eastern and Central Africa (ASARECA)—examining food price volatility in Eastern Africa suggests domestic factors are playing a role as well. The researchers found that over the last few years, even when global prices have receded, domestic prices in the region have remained high. For example, while global maize prices declined by 12 percent in the last quarter of 2008, in Kenya, Tanzania, Ethiopia, Zambia and Rwanda, they increased. The study finds food price volatility in these countries is at least partly due to barriers and policies impeding the flow of food among markets in the region and between the region and global markets. The book from the markets conference outlines a number of ‘high-payoff, low cost’ initiatives that combine ‘innovative thinking’ and ‘new technology’ along with policy reforms to give farmers an incentive to boost production—and the means to make their surplus harvests more widely available and at an affordable cost. For example, the Smallholder Dairy Project, a collaborative project between ILRI and research and development partners in Kenya, catalyzed some 40,000 small-scale milk vendors to generate an extra US$16 million across the Kenya dairy industry by seeking policy changes and providing practical training that made it easier for them to comply with national milk safety and quality standards. Prior to the initiative, smallholder dairy farmers were not realizing either their production or income potential because complex and costly food safety standards reduced participation in formal milk markets. For example, a warehouse receipt program operated by the Eastern Africa Grain Council and Kenya’s Maize Development program is offering farmers two things they previously lacked: a place to safely store surplus harvests and easier access to credit. Research has shown that on average, 25 to 50 per cent of crops produced on African farms spoil in the fields and in East Africa alone up to USD90 million worth of milk is lost per year due to spoilage. Lack of credit is also limiting the ability of African farmers to produce and sell more food. One important aspect of the warehouse receipt program is that it allows farmers to get credit using the deposited grain as collateral. They can use the credit to purchase such things as farm inputs for the next planting or meet immediate cash requirements. ‘We understand that credit is crucial for expanding production on African farms—as it is everywhere in the world—which is why AGRA is working with commercial banks to unlock millions of dollars in loans for smallholder farmers across Africa,’ said Mbaabu. AGRA’s partnerships with Standard Bank, NMB Bank (Tanzania), and Equity Bank (Kenya) were modeled on an initiative by the Rockefeller Foundation in Uganda that had only a 2 per cent default rate. ‘This shows that investing in African farmers makes good business sense,’ said Mbaabu. The book also discusses initiatives that are using post-harvest processing facilities and information technology to improve market opportunities. An analysis of processing facilities in Tanzania that make chips and flour from cassava—a crop many smallholder farmers can produce in abundance—found that they were profitable even when dealing at 50 per cent of capacity. Research in Northern Ghana found farmers were getting 68 per cent more for their harvests after using a service that provides a steady stream of pricing, market, transportation and weather information via text message. On the policy front, the market experts see an urgent need to confront the ‘hodge-podge of tariffs’ and the numerous export restrictions and customs requirements that make it hard for areas of Africa where there are food surpluses to serve those in food deficit. Critically, they recognize that private investors are in many cases playing the lead role in new investments for market development and services. Policy-makers need to shift emphasis from a traditional regulatory approach to one of co-investment to leverage private sector activity, supporting appropriate infrastructure and information systems,’ says Staal. A recent report from the World Bank on trade barriers in Africa recounted how in Zambia, the grocery store Shoprite spends USD20,000 per week securing import permits for meat, milk and vegetables. And its trucks carry up to 1,600 documents to meet border requirements. Overall, the Bank report estimates African countries are forfeiting billions of dollars per year in potential earnings by failing to address barriers to the flow of goods and services. The book, African agricultural markets: Towards priority actions for market development for African farmers, and synthesis document are available for download here. is a dynamic partnership working across the African continent to help millions of small-scale farmers and their families lift themselves out of poverty and hunger. AGRA programmes develop practical solutions to significantly boost farm productivity and incomes for the poor while safeguarding the environment. AGRA advocates for policies that support its work across all key aspects of the African agricultural value chain—from seeds, soil health and water to markets and agricultural education. works with partners worldwide to help poor people keep their farm animals alive and productive, increase and sustain their livestock and farm productivity, and find profitable markets for their animal products. ILRI’s headquarters are in Nairobi, Kenya; we have a principal campus in Addis Ababa, Ethiopia, and 13 offices in other regions of Africa and Asia. ILRI is part of the CGIAR (www.cgiar.org), which works to reduce hunger, poverty, illness and environmental degradation in developing countries by generating and sharing relevant agricultural knowledge, technologies and policies. This research is focused on development, conducted by a Consortium of 15 CGIAR centres working with hundreds of partners worldwide, and supported by a multi-donor Fund. 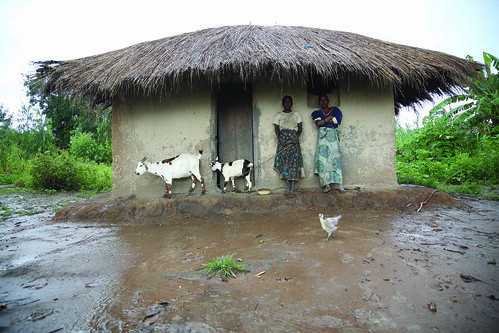 Collaborative agricultural research in Africa gets a welcome boost; village farm household in central Malawi (photo credit: ILRI/Mann). In recent months, an, initiative of the Consultative Group on International Agricultural Research (CGIAR) called the Regional Plan for Collective Action in Eastern & Southern Africa (now simply called the ‘Regional Collective Action’) updated its ‘CGIAR Ongoing Research Projects in Africa Map’: http://ongoing-research.cgiar.org/ This collaborative and interactive map will be launched in the coming weeks through fliers, displays and presentations at agricultural, research and development meetings that have Africa as a focus. Although much of Africa’s agricultural research information has yet to be captured in this map, 14 centres supported by the CGIAR have already posted a total of 193 research projects and much more is being prepared for posting. The newsletter of the Regional Collective Action—Collective Action News: Updates of agricultural research in Africa—continues to elicit considerable interest and feedback. Recent issues reported on the CGIAR reform process (November 2009) and agriculture and rural development at the recent climate change talks in Copenhagen (December 2009). The January 2010 issue reflects on the achievements of the Regional Collective Action since its inception three years ago (http://www.ilri.org/regionalplan/documents/Collective Action News January 2010.pdf). Several high-profile African networks, including the Forum for Agricultural Research in Africa (FARA), the Food, Agriculture and Natural Resources Policy Analysis Network (FANRPAN) and the Association for Strengthening Agricultural Research in Eastern and Central Africa (ASARECA), are helping to disseminate the newsletter of the Regional Collective Action as well as information about its consolidated multi-institutional research map. Coordinators have now been appointed to lead each of four flagship programs of the Regional Collective Action. Flagship 1 conducts collaborative work on integrated natural resource management issues and is coordinated by Frank Place at the World Agroforestry Centre (ICRAF). Flagship 2 conducts research on agricultural markets and institutions and is led by Steve Staal of ILRI. Flagship 3 conducts research on agricultural and related biodiversity and is led by Wilson Marandu of Bioversity International with support from Richard Jones of the International Crops Research Institute for the Semi-Arid Tropics (ICRISAT). Flagship 4 conducts research on agriculturally related issues in disaster preparedness and response and is led by Kate Longley and Richard Jones of ICRISAT. These four flagships programs of the Regional Collective Action are expected to play crucial roles in advancing collaborative discussions and activities in the new CGIAR, which is transforming itself to better link its agricultural research to development outcomes. ILRI’s Director of Partnerships and Communications, Bruce Scott, represented the CGIAR Centres at the December Meeting of the ASARECA Board of Trustees. ‘ASARECA continues to value the work of the CGIAR Centres in this region and welcome the Regional Collective Action,’ Scott said. With the four Flagship Programs off and running, the interactive Regional Research Map live on the web, and Collective Action News reporting on regional agricultural issues regularly, collaborative agricultural science for development in Africa appears to have got a welcome boost.